Over time properties do deteriorate. This also applies to the electrical system that is mostly hidden within it however it does take a long time. These days homebuyers are provided with an EICR (Electrical installation condition report). If the examination is carried out correctly it will outline the condition and operating capability of the cabling and all accessories in the electrical installation. We are seeing more properties failing these tests now due to the age of the installation. Over time, everything suffers wear and tear, including the electrical installation. We can fully test your property and tell you in what condition exactly, your fixed wiring is in. If required, we can carry out a full rewire of your property. As you can imagine this is very intrusive and does involve getting into the fabric of the building to replace all of the cabling and electrical accessories. Wycombe Electrical have carried out many, many electrical rewires in High Wycombe and nearby regions so we are fully aware of what to look out for, what to expect and how to get around problems. We always put the property back together once we have our new cables in place and clean up thoroughly behind us. Where repairs are required to plaster, ceilings, etc, we have a trusted team that we can call on to carry out finishing repairs for you. 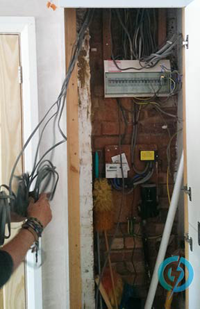 A rewire on a three bedroom semi-detached property will generally take around two weeks from start to finish. On completion we carry out a full inspection and test and provide you with a full EIC (electrcial installation certificate) and submit a copy to local building control for you.